Even though our daughters read many books on their own, we all enjoy the time that we spend reading aloud together. Since we started homeschooling in the fall of 2011, I’ve been reading aloud to the girls at lunch time. We are currently finishing Charles Dickens’ A Christmas Carol, then we will move on to the following books. 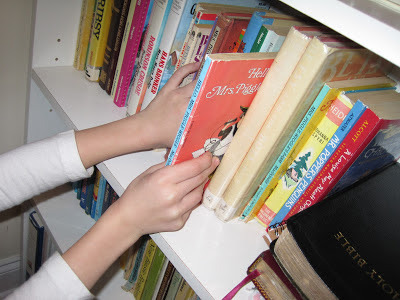 Just before the girls go to bed, we read two books – a fiction story and a Christian book (a devotional, missionary biography or autobiography, etc.) We are currently working our way through the Betsy-Tacy series by Maud Hart Lovelace and have four more books to finish. For our second book, we are reading Adoniram Judson: Bound for Burma by Janet and Geoff Benge. It is from the Benge’s series Christian Heroes: Then and Now. We have read several of these biographies and enjoy them. I haven’t read any of the books on our list for this year, so if you have, please let me know how you liked them! We are finishing up the Borrowers series right now! We are on the last book, and Sarah Beth (my oldest) loves it! I've also read Treasure Island and Island of the Blue Dolphins, and you'll enjoy both of those. Island of the Blue Dolphins has some sad parts in it, so be ready with the tissues. Thanks for the reviews! I look forward to reading those books.